This mini sculpture is made from recycled tools that are welded together into the shape of an airplane. Whether it lands in the hands of the person manning the cockpit of your company or the handyman or woman who always knows how to keep your household running, Brian Mock's industrial paperweight provides a clever way to show how much you appreciate everything they do. 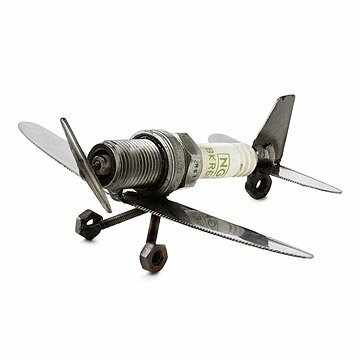 Recycled spark plugs, butter knives, nut and bolts are welded together into the iconic shape of an airplane, giving this delightful mini-sculpture the power to take off with the conversation as it taxis around your desk, workshop or tool shed. Handmade in Beaverton, Oregon. From his workspace in Portland, OR, where discarded materials emerge as works of inspired art, Brian Mock weaves his industrial magic to the delight of all around him. Of course, it's not really anything supernatural that allows Mock to create what many have dubbed as metalic masterpieces, but a commitment to precision and detail on every one of his creations. The end result is something to behold, a means of finding beauty where you might least expect it. Mock begins by sketching out a rudimentary design, or framework for what's to come, then measures each part to ensure a perfect fit, both aesthetically and practically. Approx. 3.5" L, wingspan approx. 4.5"
This airplane doesn't take up much space. My husband keeps it on his home office desk and it makes him smile every day. We love this product! We put it in our cabinet to display. Every thing about this product is amazing. It is made to last and it's very unique. There is nothing that we dont like about this product! Cool, but very tiny. Pay attention to the size, I didn't. this couldn't have cost more than two or three dollars to make. My husband is a craftsman too, and admired how straight and square the plane is. He said tack welding like this is not easy. My son makes 175 plane trips at year. He loved the gift . This is a gift that is meant to be sentimental and a conversation piece. It will most likely be on a desk as a paperweight or on a shelf. A great first piece to a collection to start!